"One more thing" remains a magical phrase for technology, even if its most famous utterer, Steve Jobs, is sadly no longer around to beguile us with the last minute big reveal. 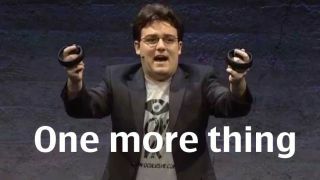 But Oculus's pre E3 2015 show finally brought us 'one more thing' that actually managed to be a surprise, with Palmer Luckey's wonderfully giddy reveal of Oculus Touch - a new input device for the Rift - bringing a genuinely warm round of applause from the usual assortment of cynical gaming hacks and pessimistic tech journos. Okay, the waves of cynicism rolled inexorably in within a few minutes of the end of the conference. "It's just a rebuilt PS Move," uttered once voice close to me in TechRadar towers. But it was genuinely nice to be surprised. Getting a 'One more thing' right takes a fair bit of skill - not least in knowing when to roll it out and when to just admit to yourself that, however much you are prepared to drink your company's Kool-aid, you need an audience who don't just think it's flavored sugar-water. Jobs, of course, was the master of the steady build, milking his audience with all the skill of the natural showman and unleashing his most famous three words at the precise moment when it would leave the room teetering on the edge of their seats. By making sure that the final minutes of his presentations often remained the most memorable bits, Jobs quickly earned himself the right to toy with expectations, and make even the more everyday announcements that little more thrilling. Luckey doesn't quite have that skill, but being rolled out only at the end, high-fiving his way to the stage in flip flops and gesticulating wildly along with his announcement all brought an energy that afforded him his own opportunity to unveil something that clearly thrilled him as much as those watching. Oculus Touch does indeed hint at a solution to one of the most tricky problems that VR faces - allowing people a tactile presence in the virtual worlds that they see in their headsets. Recognizing "hand poses" is certainly a nice touch - marking the Touch out as something that goes beyond the Move, Wii remote or even the Razer Project Fiona/Edge controllers. It's a concept that recognizes a problem, and nicely indicates that the Oculus team know that an Xbox One controller may not be the ultimate answer. Somewhat amusingly, the assembled journalists were told they couldn't actually Touch the new controllers. They are still at the prototype stage and won't be available at the launch of Touch in early 2016. It's not, in truth, unusual to find that concept tech is not ready for rigorous journalistic judgement both physically and reputationally, but that is not necessarily any indication of the quality of the final product. So, you can forgive Luckey for wanting to start the hype for his new baby, even if it's a year away from actually arriving. And I am certainly delighted that it earned a billing as a proper 'one more thing'. Did you know that Windows 10 will support the Rift?